Today’s post was written by Kevin Shaughnessy, senior program manager and Shobhit Sahay, technical product manager for the Office 365 team. For the last few years the largest email message you could send or receive in Office 365 was 25 MB. While 25 MB is more than enough for the majority of email, you might bump up against that limit when trying to send large slide decks, spreadsheets or videos. Outlook Web App (OWA) in Office 365 offers an easy way to “attach” a document as a link to where it’s saved on OneDrive for Business, a great option for sharing large files with your colleagues. But there are times when you’d prefer to send a large file as an actual attachment rather than a link. For those times, we’re pleased to announce that we’ve increased the allowed maximum message size to 150 MB, giving Office 365 administrators the ability to set the maximum message size of their choosing from 1 MB up to 150 MB. The default maximum message size for Office 365 mailboxes is still 25 MB, and we aren’t going to change the setting on existing accounts. It turns out that some folks want an even smaller setting than 25 MB and many don’t want to change the current setting at all. So instead of us foisting a one-size-fits-all setting onto everyone, we’re now giving Office 365 customers the freedom to choose the maximum size setting that’s right for them. You can customize the maximum allowed message size for any and all your mailboxes however you see fit. Want to go wild and allow everyone to send and receive 100 MB size messages? Go for it. Want to restrict students in your school from sending messages larger than 5 MB, while the faculty can send up to 50 MB? No problem. Do you have a hybrid mail configuration (some mailboxes on-premises, some in the cloud) and you want a consistent 10 MB restriction regardless where the mailbox is hosted? We have you covered. Whatever custom configuration you want to apply, whether for one, some, or all your mailboxes you can do it—as long as it’s between 1 MB and 150 MB. 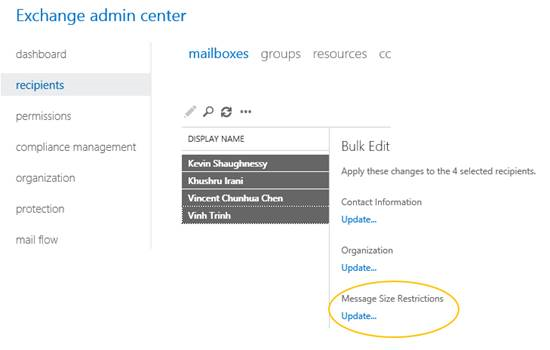 You customize the message size in the Exchange Admin Center, which requires global administrator role privileges. You can change the default for your organization by adjusting the default message size restriction. 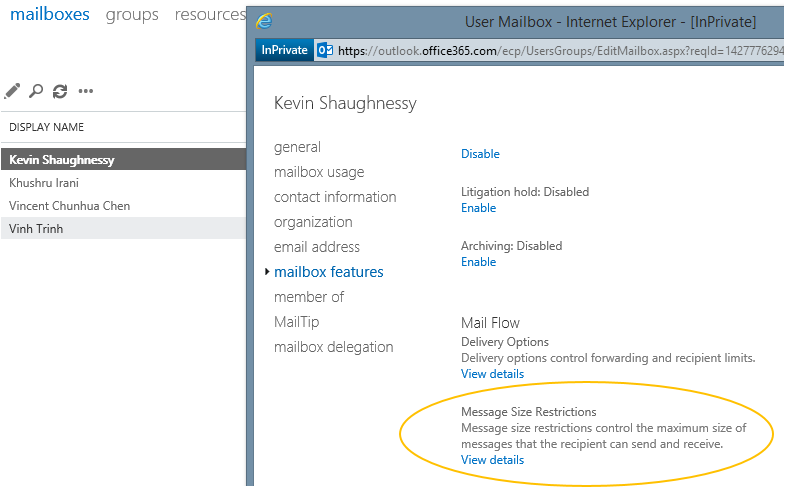 Simply select recipients > mailboxes then click “. . .” and select Set default message size restrictions. You can then specify the maximum message size for new mailboxes (those you create in the future). To edit multiple mailboxes select recipients > mailboxes and select multiple mailboxes. Then from the Bulk Edit pane under Message Size Restrictions select Update. Finally, you can customize a single mailbox by selecting recipients > mailboxes and then select a user’s mailbox. Click the edit icon , then under Message Size Restrictions, click View details and then specify the maximum message size. 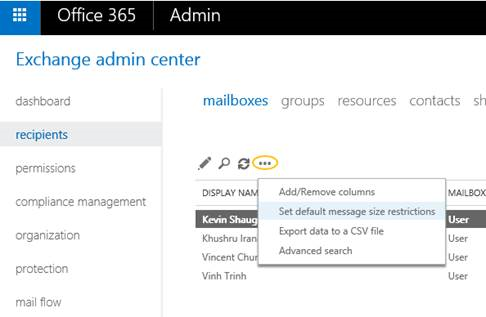 If your organization is comprised of less than 1,000 mailboxes, you’ll likely end up using the Exchange Admin Center user interface to make changes. But if your organization has more than 1,000 users, you may want to make these changes via Remote PowerShell. 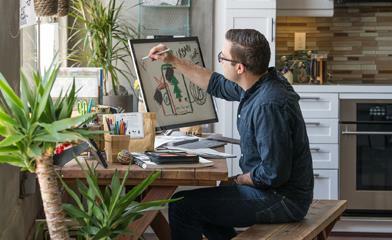 Updating thousands of mailboxes at a time can take a while to complete—a rough rule of thumb is around 5 to 10 minutes per 1,000. And while replicating the updates across the service typically takes an additional 15 minutes, allow up to 30 minutes after the update process is finished before testing out the new settings. There are a few technical details you should know when sending and receiving messages larger than 25 MB. First, as a message routes from mail system to mail system it can get larger than when it started. This happens because as a message traverses different mail systems, transcoding (or Base64/MIME conversion) may occur, most commonly between on-premises Exchange and the cloud. This results in a 33 percent larger message than when it left your outbox. Even though the maximum allowed message size is now 150 MB, this is the maximum message size threshold after any potential transcoding has occurred. If your message is going to get transcoded, then it will be limited to 112 MB maximum. Yet, not all messages are subject to transcoding. For example, most messages sent between mailboxes hosted within Office 365 won’t get transcoded, so they can be a full 150 MB in size. Second, email clients differ in their support for sending large messages. For example, in Outlook, assuming no transcoding is involved, you can attach a 150 MB size file and send it, and assuming the recipient is also hosted in the cloud and is configured to receive 150 MB size messages they’ll receive it. 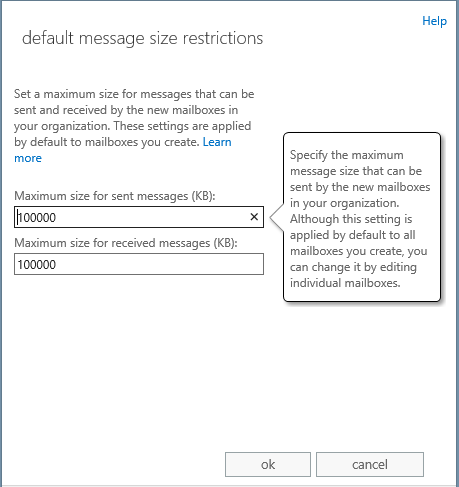 OWA, however, restricts the size of the message you can send to 25 percent less than the configured allowed maximum send size. It does this proactively to account for the possibility there might be a message size increase due to transcoding. For example, if your maximum allowed send size is set to 100 MB then using OWA you can only send up to 75 MB maximum. Additionally, in OWA, each attachment can be no larger than 25 MB. So with a 100 MB maximum send size, using OWA you could attach and send up to three 25 MB files in a single message. These conditions may change in the future, so be sure to check the official Office 365 documentation for the latest on the message size support provided by various email clients. Lastly, don’t forget that as an Office 365 customer, if you’ve customized your settings to 150 MB, you may be able to send and receive large messages up to 150 MB, but your associates may not. Whether it’s because their mail is hosted on a different email service or system that doesn’t support large message sizes, or they’re an Office 365 user but haven’t changed their settings, they may not be able to receive your large message. So if your message is over 25 MB be sure to ask them about it in advance before sending it to them.